I strongly considered just putting up the numbers for this game and skipping any commentary. I started the blog to try and put some flesh on the anaemic analysis of GAA out there – not to be a keyboard warrior slating teams/players. Let the numbers talk. Be objective not subjective. And yet …. it is extremely difficult to find anything positive in those numbers. Between them Brosnan, Banville & the two Brogans scored on 7 of 32 shots. 22%!! This from the last two players of the year and one of the best shooters from last year’s Championship. I have no explanation. One thing to note is the comparison in the possession and shot rates in this game compared to the Tyrone-Donegal game. Dublin are lumped in with Donegal when giving an example of a defensive team whilst in the absence of any stats I would hazard a guess that Wexford handpass the ball as much as either of the Northern teams. 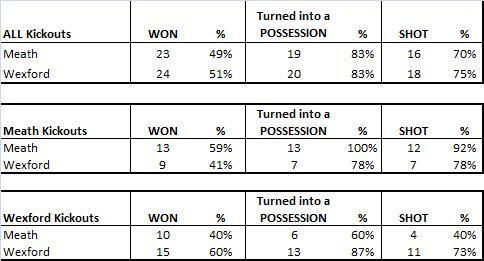 And yet there were 18% more possessions in this game and 38% more shots. Croke Park factor? Intensity? Shoot on sight versus work an angle philosophy? In the Dublin-Louth review I indicated how Bernard Brogan carried Dublin in 2010 and how the supporting cast would need to step up to the plate. Luckily they did on Sunday with McManamon, Nolan, Cullen & Connolly (when he was on the pitch) all returning positive Expected Returns. I’m willing to give Bernard Brogan a pass on his shooting from play – just look at his returns Vs Louth – however his deadball striking should be setting a few small alarm bells off. In the two games to date he has hit 40% (2 from 5). A combined Expected Return of -1.74, from just 5 shots, indicates how easy the frees he is missing are.